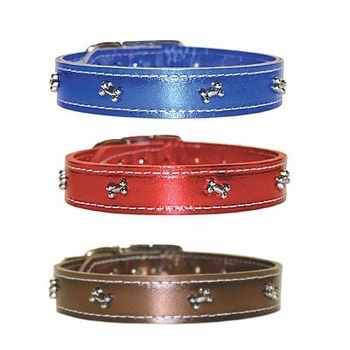 At this sale price this leather dog collar with bones is only available in the sizes and colors listed. There is only 1 collar available in some colors and sizes. This made in the USA 1 inch wide leather dog collar is available in the following sizes 22, 24 and 26. For correct collar size, please measure your dogs neck and see the size chart listed below. Size 22 will fit a 15 to 18 inch neck. Size 24 will fit a 17 to 20 inch neck. Size 26 will fit a 19 to 22 inch neck.